As Frontline marks its 30th anniversary season as PBS’s signature investigative documentary series, founding producer David Fanning is preparing to hand the reins over to Raney Aronson, the journalist and documentary filmmaker promoted to series deputy executive producer last August. Fanning hasn’t set a date for his retirement but, during the May 13-16 PBS Annual Meeting in Miami, he was in South Africa visiting family while Aronson hosted a luncheon previewing an upcoming documentary on brain injuries among former National Football League players. “I don’t want to become a sort of emeritus elder statesman or something,” says Fanning. The founding e.p. of Frontline is gradually stepping back from his leadership role as Raney Aronson, deputy e.p., builds her team. During an interview last month with Current, Fanning recalls how he came to work at Boston’s WGBH more than three decades ago, and how he and Aronson are positioning the series for the future. Since TV anchor Jessica Savitch introduced Frontline’s debut episode to PBS viewers in 1983, Fanning has been the executive editor behind more than 530 films and related projects. He’s led the series to 25 duPont-Columbia Awards, 15 Peabodys, five George Polk Awards, a Pulitzer and 58 Emmys. Statuettes fill to the brim a glass awards case near the Frontline offices and perch above cluttered desks in the newsroom and editing suite. Fanning was a young, unknown filmmaker who had produced one documentary for PBS when WGBH executives approached him about becoming an executive producer of a new documentary series that they were trying to fund. 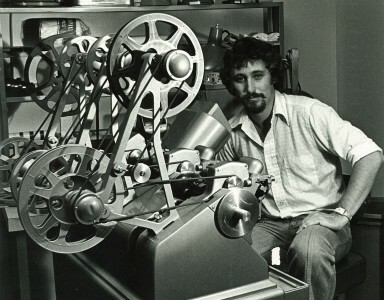 He established a unique relationship with those who became his colleagues within WGBH — one that guaranteed editorial independence for his team of filmmakers. That freedom, and WGBH’s commitment to ensuring it, allowed Frontline over the decades to tackle subjects that no one else was covering on television, drawing heat from government officials and major corporations and, as Fanning describes, informing policymakers about the issues before them. Current: In April, Frontline presented the broadcast premiere of David Sutherland’s Kind Hearted Woman, and it also debuted online as a video stream accompanied by all of the supplementary materials that your audience is accustomed to. But, in addition, a blogger-journalist was reporting on the public-policy issues behind this very personal story of domestic violence. Was that pairing of original web-based reporting and a long-form documentary a tactic for this particular series, or a part of your larger strategy to cultivate an audience that turns to Frontline’s website on a more frequent basis? Fanning: We’ve made a great effort to add a strong team of journalists on the digital front, writing about Frontline, not just on the film that’s presented each week but reaching back into our archive and finding deep connections between the work we’ve done over 30 years, our seminal works. The goal is to connect them again to the news and draw attention to the archive that is available online. It has been a refinement of the website that, together with social media, helps to reach an audience and give the films a long tail. In the case of Kind Hearted Woman, it was produced by David’s own method. 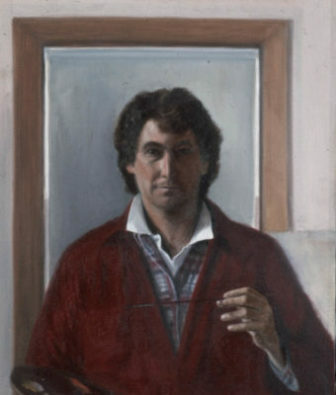 He calls himself a “portraitist”; he doesn’t pretend to be a political journalist. Yet there were some very serious issues in the film about tribal justice that we felt needed reporting. So we assigned a reporter, Sarah Childress, and she began looking into them. As it turned out, just a few months ago, while Sarah was covering the story on our website, a front-page article following up on her work was published by the New York Times. So a film that was years in the making became quite timely. We’re going to be doing more of this all the time. We’re going to expand the body of work that we put out, to leverage our content much more. We’re entering an age when people are going to find us through search as often as they are by searching with their TV remote controls. And we must begin to engage them in new ways. As we do that, we begin to have a relationship with them, and there will be a point down the road when we can say we’ve forged continuing relationships. Will they let us send them notices? Will they let us connect with them more? Will they become part of the larger Frontline family? These types of interactions are crucial to the future of this series as more people find our films online and on demand, and not necessarily on the broadcast all the time. The two platforms are interrelated. Broadcast is very powerful and we should not make light of it. With multiple television channels now, like the World channel and other places where the films can get repeated airplay, broadcast becomes a very important driver towards the website. In turn, the website is driving people to discover the films on television. Current: In 1995 you decided to publish your correspondents’ extra reporting material online so that web users could see the full interviews and other supplementary materials — the things that didn’t make it into the documentary. You’ve described that as a turning point for you. Now that news audiences are migrating to mobile platforms, how does consumption of news in 140 characters, or in 10-minute videos, affect your thinking about the web and broadcast footprint of Frontline? By publishing the entirety of our interviews with the main characters in the film, and the primary documents, we recognized that we were making our journalism transparent. Both of those acts were profound. But, sometime later, I came to recognize the limitations of watching video on a desktop computer. You tend to lean forward, the mouse in your hand, and the tendency is to click as you work, read your email and do other things. By that time, we had become more committed to the website and were putting more films on it. Because of the nature of our work, I feared that we were potentially damaging the very thing that we cared most about: the complex stories that take time to tell. And then the tablet came out. When I first picked one up, I knew instantly that it was a game changer for us. 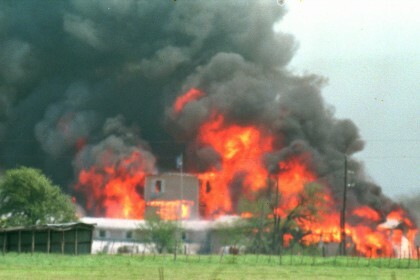 It was like that same moment from 1995 when we put “Waco” online — a game changer. Recently, I watched my wife, as she watched Kind Hearted Woman in bed, on her iPad. She was deeply absorbed by it, and watched two hours of it, uninterrupted, while I walked in and out of the room. It confirmed for me that, in so many ways, this is the future of the documentary. Documentaries will continue to be with us, not just because we believe intellectually that the culture should have these kinds of films, but because people will actually continue to watch them and enjoy them in a literary sense; they will take the time to do it. There will always be a single, powerful narrative that we need to tell, and that will be the primary thing that Frontline does and will continue to do. But we can also do additional narrative work around that film, and this will affect the making of these films in ways that we don’t quite know yet. We’re still looking for tools that will allow us to draw more deeply from the material we’re working on, and add to the narrative, giving it both depth and transparency. Right now we’re developing an app for Frontline with money from CPB. We want to build something very robust, to high technological standards, something that will be a platform to conduct those experiments, and that we can continue to build on for the future. Current: When you’re considering what stories you’re going to produce or include in a season, what are the essential criteria or elements that you look for? Is it something that is immediately apparent to you? Fanning: It is never immediately apparent. We talk a lot about the territory we’re entering, and we ask ourselves whether what we do will have enough value to distinguish it from the rest of the information culture that we live in. You can’t always claim that what you’ll create will be a seminal film, but you can say that if we don’t make it important, then it is probably not worth doing. That goes to the heart of what we should be doing in public broadcasting all the time. That should be the test of why we’re here and what we do. You ask hard questions of the subject, and you make demands of the producers, so that they’ll go out with those in mind. In return, we give them the time to do it right. Current: When you went after topics like the financial meltdown on Wall Street and the war in Afghanistan, did you make deliberate decisions to follow those issues on a consistent basis? Do you track new developments on these continuing stories, or do you look to producers to come up with a fresh angle? Frontline Correspondent Martin Smith on assignment in Iraq. Once we began to make a commitment to the war, Martin Smith and Marcela Gaviria went into Iraq. Mike Kirk was working the Washington end by doing films such as “The Torture Question” and “Rumsfeld’s War.” Marty and Marcela came back with “Beyond Baghdad” and “Gangs of Iraq.” By then we were deeply committed to this story, and we tended to push those same producers. They worked it as a beat for a while. Because of their knowledge and context, it was very valuable to keep sending them back into the story again. Marty moved from Iraq into Afghanistan and into tribal areas in Pakistan. It naturally took him to stories like “Return of the Taliban,” which was a significant film. In fact, Karl Eikenberry, the U.S. Ambassador in Kabul, said that he used that film to persuade the White House to pay more attention to the rise of the Taliban. He called it “the film that changed U.S. policy in Afghanistan.” That happened because of Marty’s continuing interest in the subject, and then “Obama’s War” sprang out of that. These are seminal films. These films will be used and studied — looked at as part of the historical record and as important milestones in reporting. Current: As far as impact, when you’re working on a film, do you aim to inform the greater society, or policymakers? Fanning: The films have real value as — this is an old-fashioned phrase — “white papers.” Back in the day, NBC actually called their documentaries NBC White Paper as if they were serious documents of public policy. The fact is, films can be used in the corridors of power to instruct. 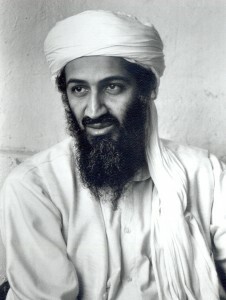 Frontline‘s 1999 film on Osama bin Laden, “The Terrorist and the Superpower,” was rebroadcast as “Hunting bin Laden” after 9/11. The documentary circulated on Capitol Hill as a briefing document for members of Congress and their staffs. This happened most vividly during 9/11, when we rebroadcast “The Terrorist and the Superpower” as “Hunting bin Laden.” That film was circulated around Capitol Hill. In screenings with hundreds of members of Congress and their staff, they were being briefed for the first time about al Qaeda and bin Laden. When our work is presented in this way, it’s enormously flattering to us, but it’s also a huge responsibility. When we did “College, Inc.,” it moved the needle. Sen. Tom Harkin [(D-Iowa)] picked up on it in congressional hearings on for-profit colleges. When we followed up with “Educating Sergeant Pantzke,” there was a second hearing, on the GI Bill. Those documentaries have value. In a society where fewer people are prepared to read long research documents, producing a lucid, literate, intelligent, astute film that can be viewed as a DVD or online is a real contribution to discussions of public policy. We can’t help but think about this role for our work. We know that “The Untouchables” (which reported on Wall Street executives escaping criminal charges) had impact in prosecutors’ offices around the country. We’ve been told there was a sudden burst of activity in the wake of that film. At the U.S. Justice Department, the film influenced the cases that they began to look at more closely. The Bettag report, as it came to be known, described frustration among TV producers that the fragmented public TV system had become an impediment to presenting their best work. Bettag recommended that PBS’s news producers collaborate in gathering, producing and distributing the news. Why wasn’t the Bettag report ever discussed publicly? What happened? Fanning: I really don’t know what happened with the report. The heart of that idea was the creation of a new independent collaboration or consortium that challenged participants to work together. This was during the breakdown of local and national newspapers, and it was an opportunity for public television to strengthen its news profile and to help make the case for working closer with NPR. I thought we should try to recruit many of the premier journalists in the country who were taking buyouts or being laid off and looking for a new space to continue their work. We could encourage them to come in to write and to report, and they could perhaps mentor and develop a younger reporter or two in their beats. And we would publish aggressively online to connect with the local, independent online news operations that were just springing up — ProPublica, and what became the Texas Tribune and the Voice of San Diego and other outlets. I thought we should forge strong connections with those entities. That was the idea at the time. It’s an idea I saw translated into the Atlantic Wire, at least it was very similar to what they did. But it didn’t happen. There were competing ideas in public television. It was never really tested enough to find out if it would have worked. Clearly, we still need to work together, but each of the teams producing PBS news programs have to figure out how to ensure the survival of their own series. That’s been the case at Frontline, certainly. Looking at the changing landscape, we just doubled down. I had competing interests because I was working to ensure Frontline’s future. But I also believed in a bigger idea. We’ve definitely made a lot of progress in working with the NewsHour. Raney Aronson, our deputy executive producer, has been a key part of that. She’s helped to forge a much stronger relationship with them, and they have been terrific about doing so. These kinds of collaborations are only going to increase. We will be sharing more material with them, on a regular basis, and do what we can to support that idea and any other extensions of it. Current: Is there still an opportunity to create that “third space?” Or is it too late? There was a real sense of urgency to the report when it first surfaced. Fanning: There is still a space for us to do this. It’s a question of the public television system making a concerted decision to say that public affairs journalism is important, and to make a bigger commitment. I believe that it is important, because I see it as one of the things that can distinguish public television. We’ve never made the commitment to it as deeply as we should, in terms of the mission of public broadcasting. As part of the entire spectrum of public television programming, we do have to compete with other programs across the landscape, but we can distinguish ourselves by doing work that nobody else is doing. It is a long internal struggle between that ambition and programmers’ reluctance to support news and public affairs programming. That might be in part because they haven’t been given enough good news and public affairs programming. It is hard to make, and expensive, to do original journalism. But that’s how we get attention for our work — because we’re doing original journalism, because we’re breaking ground. This draws attention because we’re doing it well, and it’s hard to replicate. There are talented journalists around the country who would welcome a home and an opportunity to work in public television. As you see the rise of nonprofit newsrooms such as ProPublica, and the strengthening of the Center for Public Integrity and Center for Investigative Reporting and others, it makes sense that they would have a natural home with public television. Current: Were you moving in that direction of creating that “third space” when Frontline began collaborating more with those organizations? Fanning: That is exactly what we did with Frontline — strengthen those relationships. Raney has been a significant part of that. She’s proactively encouraging strong editorial engagement, and it develops into trusting relationships between ourselves and other editors. Current: That doesn’t happen easily — developing trusting relationships with other news organizations, does it? Fanning: It’s all about the individuals who are involved. You can talk to each other and respect each other, and then you may do some work together, and know you can do more. We’d done terrific work with Marketplace over the years, but it had been somewhat ancillary to our films. And yet that relationship led very naturally to a story we were doing on campaign finance in Montana. Raney and I had a meeting with Deborah Clark and JJ Yore, our counterparts at Marketplace. We agreed to undertake the reporting together, with Kai Ryssdal as the correspondent. That’s how we produced “Big Sky, Big Money.” It is a terrific film, a great investigation and a great proof of collaboration. During the reporting, we discovered boxes of campaign documents that had ended up in a Denver meth house. There were more than we could analyze — so we handed them over to ProPublica, where Kim Barker got deep into reporting on them and began to publish jointly with us. Then, as we were making the film, Marketplace produced five stories for their audience, which is substantial, and finally the film landed on public television with a big audience and a very wide journalistic footprint. That is a model for transmedia reporting that we have to forge in the future. Current: From that view of the future, I’d like to ask you about the beginnings of Frontline. We’ve often heard that you were working at a tiny station in Huntington Beach — KOCE, which now calls itself SoCal PBS — when Peter McGhee, then head of WGBH national productions, traveled to California to ask you to work on a new WGBH program called World. Did he have the funding for the show at that time, or was it an idea? Fanning: No, they didn’t have the funding. They had a proposal that Lou Wiley, who later became Frontline’s executive editor, had written. Peter and Lou had developed the proposal together. I had done a film in 1975 about the Angolan Civil War somewhat on the spur of the moment at PBS’s request. I gathered footage from Britain and other places, went to Washington to do interviews and produced it for about $8,000. It was called “The Agony of Independence.” That was how people at WGBH came to know that there was this young filmmaker out in Huntington Beach. The Angola film was successful enough that I wrote a proposal to do four more films at the grand cost of about $15,000 each. Somehow that proposal got to Peter McGhee, who had his own proposal for World. He was coming out to California and proposed to meet me for a few hours. He got off the plane, and I took him to my house near the beach and we talked about World. My overwhelming interest was to produce films for a series like that, and I was very excited by the idea. Then he mumbled something about an executive producer job. I was not interested in that. To me, an executive producer was somebody who wrote the check and put his name on your program. I think I demurred. 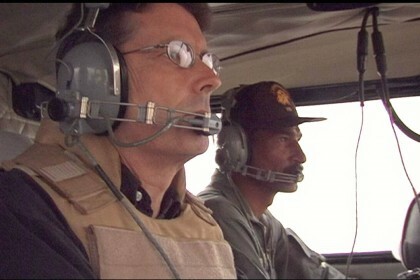 But almost immediately I realized my mistake and called Peter back and said I was interested in the executive producer job, and he agreed to fly me to Boston. I was interviewed by Peter and Lou, as well as Michael Rice, WGBH’s general manager, and Roger Fisher, the creator of The Advocates, a public-affairs debate program that Peter and Lou had also worked on. Improbably to me, they saw a young unknown filmmaker from South Africa as somebody who could carry off the idea for this new series. But they didn’t have all the funding for it. They asked, “Can you go to New York? We’re going to meet with the Ford Foundation.” I was terrified. I went to the meeting with Peter and Michael Rice. I remember wearing my black leather jacket — it was the only jacket I had — and my hair was way too long. We sat in a conference room with a table that was the size of a football field. In came this enormous man named Fred Friendly, who put me through the toughest oral exam of my life. I still have no idea why, but Fred agreed that Ford should fund the series. He was very nice to me in the years after, and took lots of credit for launching my career. World had a fairly modest budget. We set out to acquire some films, co-produce some films and make a few. There were a few producers who we brought in then, some of whom we have relationships with still to this day. Current: Such as Ofra Bikel? Fanning: Yes — and Bill Cran, Marian Marzynski and others. World was an enormous privilege. Not only did I get to work with talented producers, but as soon as I got the job, I wouldn’t let Lou Wiley get out of my sight. He became my closest colleague, a sort of adjutant, consigliere and editor. Current: What was Wiley’s role at WGBH at that time? Fanning: He was working with Peter to develop ideas for national productions. Peter always had a group of people developing ideas for him, many of whom were graduates of The Advocates, which was a rigorous training ground for smart people in broadcasting. At the beginning, Lou and I went looking for every good documentary we could find. We began screening 16 mm films from around the world. World was intended as a series about the world as others see it, not necessarily through American eyes. Amongst a lot of good films that we screened, we discovered some really terrific, singular work. I had a self-taught idea of journalism, with no formal training. Much of my training came through the experience of producing World with Lou at my side, and he was learning as I was. We were on the same journey of discovery. Peter McGhee was our mentor. I kept looking at the films to find the intersection of terrific filmmaking, good journalism and compelling storytelling. I wasn’t interested in the earnest and the didactic — the spinach of documentaries that sprang out of the traditions of instructional film. I was drawn to films that had passion and skill in the telling. I would screen and then call up people like Antony Thomas, a British filmmaker, and say, “How did you make that sequence in your film?” The filmmakers were intrigued by my questions, and I got to know them. Out of that sprang an appreciation for and connections to people who helped to shape my sensibilities about both films and journalism. Current: How did World come to be Frontline? Fanning: We started World in 1978, and ran about 60 films, up until ’82. After Ford, we’d been funded by CPB and other sources. Lewis Freedman, a pioneering producer with CBS and other networks, had become CPB’s top television programming officer. He looked at the proposal process for TV programs and said, “This is too crazy. There are too many decisions, and I shouldn’t be making them.” So he decided to essentially fund three different types of programs: drama, which became American Playhouse, and a children’s program, which became WonderWorks. For the third, he wanted something in the documentary world. We got sandwiches and went back to his office, and I scribbled up a budget, and came up with $3 million. He proposed to fully fund the first year, and for the next two years we’d take it to the Station Program Cooperative, which was a marketplace system that PBS used to commission national programs. In the second year, the SPC would contribute $1 million, and in the third, $2 million. After that we had to make it on our own with support from PBS and stations. It was essentially a challenge to the public TV system to make a three-year commitment. And that’s how World became a new series, which we came to call Frontline. Jessica Savitch of NBC News, pictured with David Fanning in 1983, hosted Frontline‘s first season on PBS. We constructed it as a consortium of five stations — New York, Boston, Seattle, Detroit and Miami — which served as the governing board and supervised the hiring of the executive producer. There was also an editorial advisory committee. That word — “advisory” — was important because editorial decisions were to be made by the series editorial team. Peter McGhee was very clear that the executive producer would have editorial responsibility. And there were no deals with any of the stations; it was an open marketplace of ideas . . .
Current: By that you mean that none of the stations were guaranteed that they would get to produce shows? Fanning: There were no guarantees to anybody. There was disappointment by some consortium members who expected to take off some piece of the booty. Current: Back then, you wanted to ensure that your unit worked in a space that was separate from the rest of WGBH, so that you could be independent. Why? Fanning: It was because of the consortium; I thought that it was important to be somewhat separate. It also gave us a degree of flexibility in the decisions we made. I wanted to be able to operate independently, so we wouldn’t be constrained by an internal bureaucracy. It also allowed us to hold onto some of our distribution income, to do things that were important specifically for the series. It was useful. Current: Did the relationship with WGBH insulate you when political pressures were brought to bear on PBS or CPB? Fanning: I’ve always had an extraordinary support from WGBH. My strongest support came from right here. That was especially true for “Death of a Princess,” which was broadcast despite tremendous political pressures that were brought to bear on public TV. It’s a story I’ve told publicly many times. WGBH backed the film and made the decision to rent space on the satellite to broadcast it, in case PBS wouldn’t stand up for it. There was political pressure from the highest levels of government; from Mobil Oil, which sponsored Masterpiece Theater; and from Congress — and pressures on stations. 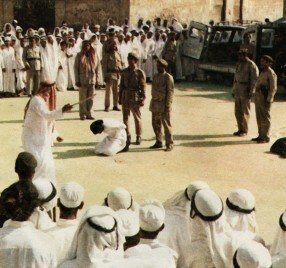 After national broadcast of “Death of a Princess,” a 1980 film that brought pressures from the “highest levels of government” on public TV, Fanning gained confidence that a series such as Frontline would be protected from editorial interference. When the film did go out, the sky didn’t fall. We survived all that pressure, and it inspired the idea that we could do something like Frontline. Peter McGhee later said it “put a chock behind the wheel of public television.” That was the moment when we said, “If we can do that, then we should be able to do a series like this.” And I knew I worked at the right place: I had people who trusted me, and whom I could trust, editorially. That has been true ever since. The construction of Frontline as an independent entity gave us almost a psychological advantage that was reflected in the editorial sensibility of the series itself. It’s a responsibility that fell to me and to Lou Wiley, and to others around us, that we wouldn’t get it wrong, that we would be relentless about getting it right. We were able to deliver films to PBS without an additional review process. The statement “Frontline signed off on it” meant that it was ready for air. If anybody raised questions, we were ready to defend it. And ’GBH was ready to defend it, legally, as well, because we’d done our work. That is still true today — and it is an extraordinary privilege. It is unequal to any broadcast, anywhere in the world, really. That is quite staggering to me, and it is quite humbling as well, that we’re trusted to do this. Current: We’ve been hearing about the pressure from PBS on the iconic series to reduce production costs. Fanning: We’re entirely sympathetic to that. Look, they’re under pressure financially. They’ve got a limited pot of money. There is constant pressure about the future of congressional funding, and the strength of individual stations, and the amount of money for the National Program Service. We’re really sympathetic to that. At the same time, original journalism doesn’t come cheaply, and we have to be very careful that we don’t end up reducing our ability to make these films. We don’t want to lower the quality of the series. We have to try to be as clever as we can in reducing production costs when we can. This puts pressures on our producers — who already have enormous pressures on them. Current: Frontline has relied on a lot of independent producers over the years, hasn’t it? Fanning: Yes, they run small, independent companies, and they’re hard to manage on documentary budgets. There are so many burdens on them, including the requirements of our contracts — because of the federal money that goes through the system, not to say all of the clearances, the reports on deliverables and the time it takes to manage these productions. Let alone do enterprise journalism with cash flow problems. These are usually tiny production companies of two or three people. It’s not easy on them. It may be that these producers are going to be pushed together to come up with economies of scale, to find ways to work together to allay some of those costs and find more efficient production models. We want to help them adapt. We ourselves have a very small editorial group: Raney and myself, and a few people helping us, like Carla Borras, our deputy story editor. We’re now in the process of recruiting a new senior producer and series editor. Editorially, that’s a very low overhead for a series of this scale. Current: What about the request to produce 26 new episodes per season? Fanning: It is great to have the extra hours for stories, but it is also a lot of work to put out 26 films every year. The big challenge is to strengthen our team editorially — that is, to strengthen Raney’s team. Because in the future I am going to shift into another role around the series. Current: What are your plans? Will Raney succeed you, and when? Fanning: Raney and I are very open about this. This is a continuing, open discussion between us and amongst our producers and others about an orderly succession as she builds her team. It is quite clear that she brings enormous energy, intelligence and passion to this job. Current: Could you tell us how she first came to Frontline? Fanning: Well, she picked us. She has had a very interesting career, and lived in several countries in Asia. She came back to the U.S. and went into Columbia’s graduate program for journalists. She worked at the Wall Street Journal while she was a student, then worked at MSNBC briefly and headed to ABC, where she joined the long-form unit and also worked on specials with Peter Jennings. When Raney Aronson was promoted to deputy e.p. in August 2012, Fanning signaled that she was his choice to succeed him. 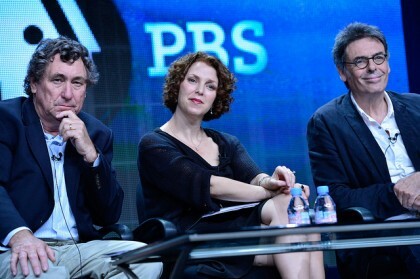 She’s pictured during a Television Critics Association session with Fanning, at left, and Michael Kirk. I met Raney as one among a new generation of young producers who had picked up cameras and began shooting themselves. They were challenging the in-house division between camera operator and producer. I was on a panel with her at Columbia, discussing new technology and how it would change how we work. It turned out that Raney had been in contact with Karen O’Connor, who worked at Frontline as a story editor at the time. Raney brought us her proposal to do a film about alternative medicine. She was on a sharp rise at the networks, but later decided to leave ABC because she wanted to become an independent producer. I saw her potential, and I said to her, “You can trust us. You do this — you do what you say you can do — and we’ll back you and we’ll support you,” and that is what happened. She made several good films for us —“The Alternative Fix,” “The Jesus Factor,” about the impact of evangelical Christianity on politics, and “The Last Abortion Clinic,” about how the anti-abortion forces organized to influence the politics of Mississippi. Both sides of that political battle saw her telling of the story as eminently fair. If there is one thing that you find as you get to know Raney it is that she has this fierce commitment to fairness in journalism — I mean fierce. The story of the Frontline editorial decisions around her Mississippi film became a case study at Columbia’s journalism school. It’s well worth reading because it is a model about how to tackle a difficult subject. I asked her to come to Boston to be a senior producer, and she joined the staff in 2007. I had spent enough time in edit rooms with her to see that as a filmmaker herself she has the ability to translate ideas into the practical business of how to structure a sequence. And also the most significant part of the job: to be an editor in the old-fashioned, blue-pencil sense of it, an editor who can look at a rough cut, and restructure, and help an author tell a story smartly and well. Current: Have you made any decisions about how long you intend to stay actively involved with Frontline? Fanning: No — the immediate issue is to strengthen the bench for Raney. I’d like to be able to work on special projects and become more deeply involved in the challenges of the future — the business model and how Frontline can position itself for the long term, and the ways we can raise more money. Some may develop into ideas that could be spinoffs of Frontline. Current: Are you pondering a foundation, like a Masterpiece Trust? Fanning: We have something called the Frontline Journalism Fund, which I started in 2008. The fund has been very useful. We’ve attracted several hundred thousand dollars a year from donors, allowing us to explore leads and do the type of long-form journalism for which Frontline is so well known. Current: Is it an endowment? Fanning: Not yet — it’s a spend-down. We use the money for what we call “wildcatting” or enterprise journalism. If we’re looking at a story and are uncertain about whether it will pan out or not, we’ll invest in it with ProPublica or another journalism center, and see where it goes. If it works out, we’ll invest in production. That is the purpose of it, but we could do more fundraising and it could become more robust. I don’t want to become a sort of an emeritus elder statesman or something, and I’m very conscious of the Founder’s Syndrome — you know, the founder who can’t let go. I’m just here to really be helpful. I joke all of the time that I’m here to back Raney up. I’m very comfortable with the way we’re doing this transition. It is as transparent as we could be about it. Current: You’ve occasionally been critical of public TV’s pledge drive practices. How do you feel about the commercials that run on programs through PBS.org? Fanning: It troubles me deeply. When a Goldman Sachs spot comes up at the beginning of Frontline, it bothers me. Then it comes up a second time on the opening of the second chapter, and that bothers me even more. I think we’ve bartered something away for some pieces of silver. I know this provides revenue, and I understand that part of the rationale for doing it is to help support the expensive costs of streaming video. But this is so simply and obviously something that CPB should pay for; it is so much a part of the future of this enterprise that it doesn’t justify the commercialization of this space. I’ve said this before in public: One day, we will wake up and realize that our programs mostly live in this online space. What will we do about those commercials then? How do we justify to Congress that we’re noncommercial? I see it as very shortsighted, and as a slippery slope — very troubling. I have a hard time believing that those commercials bring in very much revenue. We know how hard it is for fully commercial enterprises to make serious money on digital advertising. There has to be another way. Current: But there are many public broadcasters, particularly in public radio, who believe the system should pull away totally from government support and become more independent. Fanning: Look — there is a civic trust involved here. We have public money, and individuals respond to that and are prepared to be members of this enterprise. If we are to make that case strongly, again and again, we’ll do it with distinctive and innovative programming — in a noncommercial environment. The more that we can demonstrate that what we do is different from anybody else — the more we can make the case for more journalism, for more programs like Frontline, the more we can make the best argument for people to contribute. More viewers are prepared to contribute. Maybe contributions that they make online can become much more direct, and we can develop closer relationships with people who will support our work. Current: Some public radio producers have been successful in raising direct listener support of their programs. Fanning: They have been — shows like This American Life have been very proactive. Current: Are you prohibited from asking for direct support? Current: Is there something outside this type of journalism that you see yourself doing when you do retire? Fanning: I’ve always painted, mostly portraits, and I studied painting in Italy. I’d love to go back into the studio again and paint. A self portrait by Fanning. I love stories of adventure and journeys. I’ve always believed that we limit ourselves too much to investigative films in a strict journalistic sense, and that we could go out into the world to make films that are as much about culture, music and place as they are about politics. That way you’d get closer on television to the work by great writers like Paul Theroux or others. There is a wonderful book called Bird of Life, Bird of Death by Jonathan Maslow. It’s the story of an ornithologist in the middle of the Guatemalan civil war. I loved his juxtaposition of politics and natural history. When I created a documentary series called Adventure in the ’80s, we got Jonathan to make a film with us: A Tramp in the Darién, where he walked the Darién Gap, between Panama and Colombia — a wonderful film. It had an edge of sadness; he had personal troubles, and he has since died. But that combination of the personal, of a place and a journey of discovery, I’d love to see more of. Certainly, there are happier tales to tell, but maybe I can come up with something like that to do. Maybe be a producer again, go to Angola, or somewhere. The creator of Frontline often speaks up for more productions that aim directly at public TV’s mission to inform and educate. 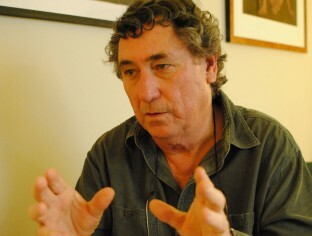 In his speech accepting a Quinnipiac University award in June 2011, David Fanning urged public TV to brand itself with strong journalism, as public radio does, and he warned that pledge-drive excesses are tarnishing the field’s reputation. Accepting an award at Harvard’s Shorenstein Center in March 2010, Fanning described how Frontline has developed its use of the Web, adding online depth to its reporting and expanding its audience with online video streaming. News organizations should free themselves to differentiate YouTube content from their marquee products, the panelists advised. Frontline is the best Documentary and investigative series that PBS had for 30 years.